Dr. Crutchfield, my neighbor recently traveled to Africa and told me he caught malaria when he was there. What is malaria? Malaria is an infectious disease that is spread by mosquito bites. It is estimated that over 200 million people contract malaria every year around the world, and over 500,000 people die every year from the disease. Most deaths from malaria occur in Africa in children under the age of five. The mosquito is the carrier of a parasite that is in the saliva of the mosquito. When mosquitoes bite humans, they inject a unique anticoagulant contained in their saliva into the site of the bite so they can keep drinking blood without the blood clotting. In addition to the anticoagulant (which stops blood from clotting), the saliva of an infected mosquito also contains the protozoan parasite that causes malaria. Protozoa are single-celled organisms that are larger and more complex than bacteria. The exact type of protozoan that causes malaria is called Plasmodium. There are four sub-types of plasmodia that cause malaria. Plasmodium falciparum causes the most severe forms of malaria and is responsible for the most deaths caused by malaria. Malaria played a very significant role in World Wars. In World War II, over 500,000 American soldiers were infected with malaria. An estimated 60,000 American soldiers died from the disease, which is more than the total number of soldiers who died in the entire Vietnam War. The parasite enters the blood of a human from the infected mosquito bite. Interestingly, only female mosquitoes transmit malaria. Male mosquitoes don’t drink blood. When the parasite infects red blood cells and is released from red blood cells into the blood, the symptoms of malaria occur. Once the parasite is in the blood, it travels to the liver, where it lives and matures. After maturation, the parasites move into the blood and infect red blood cells. This maturation process usually takes two to several weeks, but some strains of the parasite can lay dormant in the liver for up to a year. At this point, if a person is bitten by an uninfected mosquito, that mosquito can become a new parasite carrier and infect another uninfected person, continuing the spread of the disease. 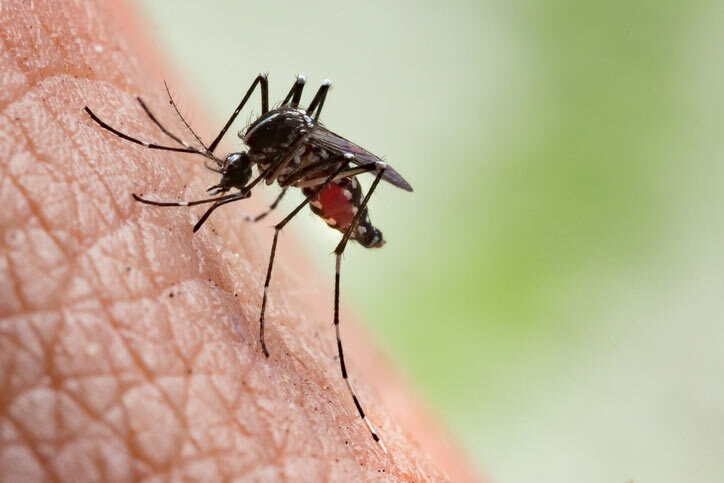 In addition to mosquito bites, malaria can be transmitted from pregnant mother to fetus, via blood transfusions, and from shared needles. The initial symptoms of malaria are very similar to having the flu. They usually occur about two weeks after the mosquito bite, but in some cases may not develop for over a year. Malaria symptoms include fever, chills, nausea, diarrhea, headaches and vomiting. One of the hallmarks of having malaria is a condition called “paroxysms.” This is when a person cycles between shivering chills and sweating fevers. Sometimes, without treatment, malaria can recur in the same person several times. In severe cases, malaria can affect the brain, lungs, and other organs, leading to death. Malaria is prevalent in sub-tropical and tropical areas such as sub-Saharan Africa, the Subcontinent of Asia, and Central America. If a person is traveling to a malaria-prone country, they should talk to their doctor and take preventive medicines before, during and after the trip. The best prevention is to avoid getting bit by mosquitoes. This includes using effective mosquito repellants and bed-netting so mosquitoes can’t bite at night during sleep. Some people who live in malaria-infested areas develop partial immunity. This immunity is lost if they move to an area that does not have malaria. Scientists feel that having the condition of sickle-cell anemia may be an advantage in that the abnormally shaped red blood cells resist malaria infection. Surprisingly, malaria has been complicated to develop a vaccine against. There is a promising potential vaccine currently being tested in Europe, but it is not commercially available at this time. There are several blood tests available to diagnose malaria. Some are rapid, and some can take several days. The standard test is to look directly at a patient’s blood and observe the red blood cells that have a classic appearance when infected by the malaria parasite. Treatment for malaria is based on several factors, including which malaria parasite the person is infected with, the patient’s age, the severity of symptoms, and pregnancy status. Many medicines used to treat malaria are no longer effective. The history of malaria treatment is marked by developing new, effective drugs as the parasites develop resistance to the standard, older medicines. However, the overwhelming majority of patients treated for malaria will recover fully and have healthy lives. If you travel to a high-risk malaria region and develop flu-like symptoms, talk to your doctor about the possibility of being tested for malaria.